Aston Martin Rapide S Performance, Engine, Ride, Handling | What Car? Aston Martin’s V12 petrol engine is one of the largest engines on sale and it certainly takes centre stage when driving the Rapide S. There are no turbochargers to aid response at low revs, but, to be frank, none are needed. Although the V12’s best work is done higher up its rev range, it pulls brilliantly from low down in most gears given the colossal amount of torque it produces. Push it hard and you’ll struggle to believe something quite so large and heavy as the Rapide can move down the road with such visceral urgency. 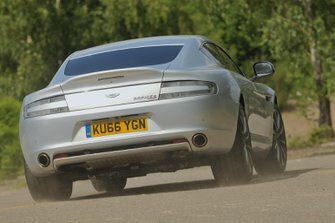 It’s perhaps a shame, then, that the Rapide’s exhaust note seems muted compared with Aston’s other more sporting V12 models such as its Vantage and Vanquish. The standard eight-speed automatic gearbox is also less impressive. At higher speeds and when using the column-mounted paddles for manual changes it flicks between gears no problem, but at slow speeds in town it feels jerkier both on manual switches and in Drive. Unfortunately, the engine rather overshadows the rest of the driving experience. Even in its Normal driving mode, with its suspension at its softest, the Rapide is unsettled by ruts and bumps at all speeds, while selecting firmer Sport mode simply makes things even more uncomfortable. 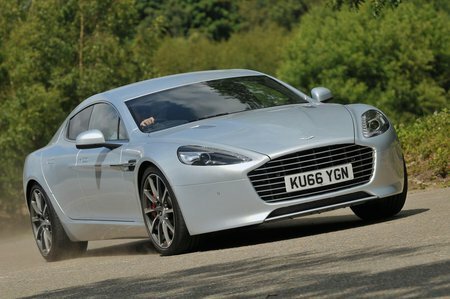 And the car’s big dimensions hurt its handling, too, because despite having nicely precise steering the Rapide doesn’t feel particularly agile. That poor ride quality also means it’s easily unsettled mid-corner, which isn’t something that inspires confidence in such a large, powerful car on tight UK roads. A Porsche Panamera Turbo manages to feel far more composed at speed and therefore more fun to drive on our roads. It’s a shame that you also have to put up with a noisy interior on the move. The Rapide’s huge wheels kick up a large amount of road noise on all Tarmac, but particularly over coarse surfaces. True, wind noise is well suppressed, but all the Rapide’s main rivals are more comfortable and quieter cruisers.